"I want every woman who has ever cursed her thighs, sucked in her stomach when she got out of bed naked in front of her partner, hated another woman for being thinner, or otherwise judged her body to read this book. Anna's stories will heal you. Her yoga suggestions will liberate you. This book is a transmission of something essential that so many of us need. Please read it and then give copies to all your friends. I love this book!" --Jennifer Louden, author of The Woman's Comfort Book and The Life Organizer "Finally. A book that puts our culture's destructive body-shaming to rest and gives women the tools they need to forge a new, more loving relationship with their bodies. In Curvy Yoga, Anna shares her own journey from shame and self-loathing to compassionate curiosity and self-love with gentle humor and great insight. In doing so, she shows every woman who has ever struggled with body acceptance how to 'love herself to inner freedom.' The practices she offers and the wisdom she dispenses encourage us to be kind and take time to get to know our bodies not as adversaries, but as friends and allies; to soften the way we treat and speak about them; and to embrace what we need to feel joyful and whole." --Linda Sparrowe, former editor-in-chief of Yoga International, and author of Yoga At Home: Inspiration for Creating Your Home Practice I want every woman who has ever cursed her thighs, sucked in her stomach when she got out of bed naked in front of her partner, hated another woman for being thinner, or otherwise judged her body to read this book. Anna s stories will heal you. Her yoga suggestions will liberate you. This book is a transmission of something essential that so many of us need. Please read it and then give copies to all your friends. I love this book! Jennifer Louden, author of The Woman s Comfort Book and The Life Organizer Finally. A book that puts our culture s destructive body-shaming to rest and gives women the tools they need to forge a new, more loving relationship with their bodies. 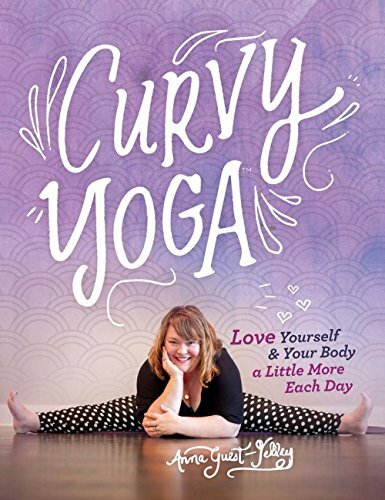 In Curvy Yoga, Anna shares her own journey from shame and self-loathing to compassionate curiosity and self-love with gentle humor and great insight. In doing so, she shows every woman who has ever struggled with body acceptance how to love herself to inner freedom. The practices she offers and the wisdom she dispenses encourage us to be kind and take time to get to know our bodies not as adversaries, but as friends and allies; to soften the way we treat and speak about them; and to embrace what we need to feel joyful and whole. Linda Sparrowe, former editor-in-chief of Yoga International, and author of Yoga At Home: Inspiration for Creating Your Home Practice "
Yoga is for everyone - not just the young and lithe! Because Anna Guest-Jelley understands what it's like trying to force yourself into poses that won't take and feeling short of breath, she created Curvy Yoga to embrace all shapes and sizes. She rolls out a welcoming introduction to the practice, along with personal stories of growth, classes gone away, clueless gurus and the fat-shaming that pervades the yoga scene.